Accepta 0029 is a high performance cooling water corrosion inhibitor based on a balanced nitrite blend of cathodic, anodic and non-ferrous corrosion inhibitors. Additionally, it also incorporates a scale inhibitor to provide adequate protection against the formation of scale. Accepta 0029 is specifically formulated to provide tolerance to fluctuations in pH values. 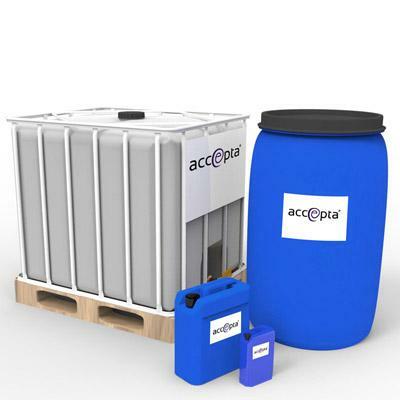 Accepta 0029 has the particular ability to inhibit corrosion during periods of low flow and during static conditions when systems are shut down or off-load. High performance nitrite based blend of cathodic, anodic and non-ferrous corrosion inhibitors plus additional scale inhibitor. Excellent corrosion protection even under static conditions. Corrosion protection for non-ferrous metals. Accepta 0029 should be dosed to the system, at any convenient point as a bulk dose in proportion to the amount of make-up. It may be dosed direct from the drum or diluted, if required, for convenience of dosing to small capacity systems. Normally a reserve of 500 ppm of Accepta 0029 is maintained in the treated water at all times. A simple test method is available for control purposes and performance may be monitored using corrosion test specimens.